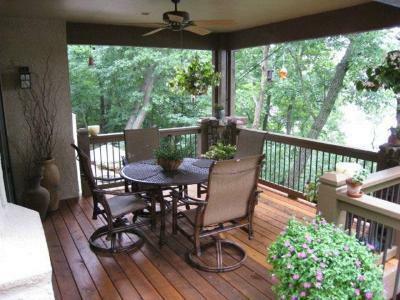 Should your new Kansas City area screened porch have a gable, shed, flat or hip roof? 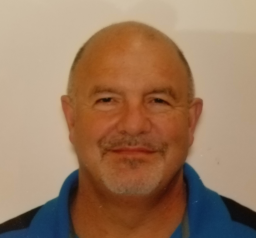 Gable? Shed? Flat roof? Hip roof? The roof style you choose for your Kansas City area screened porch is one of the earlier decisions you will make when planning for your new space. You probably have a vision in mind of what your screened porch will look like and for many homeowners that vision includes a gable roof style. A gable roof has a high point in the middle and slopes down to two sides from there. This is different from a hip roof that slopes down to 3 sides from the highest point. A gable roof is a popular choice because the gable allows for lots of sun to enter the porch. One of the top reasons homeowners want to add a screened porch is to have a bright and airy room to enjoy fresh air while still having some protection from the elements. A gable roof is also very pleasing to the eye and creates a vaulted ceiling from the inside. How should you determine what roof style is best for you? There are a number of factors and your builder will help you work through them. 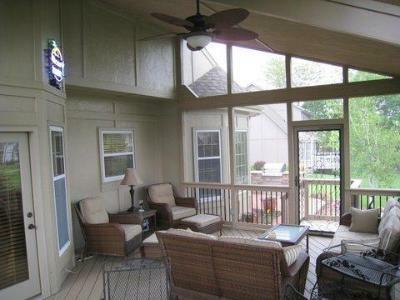 The most important factor is how you want to live on your screened porch. Do you want a room that invites the most sun possible? Do you want a room with a very cozy feel that invites you to cuddle up with a warm throw and a cup of hot cider? Do you want a more functional room to add more seating capacity when you have evening guests? How about regular movie night with the family? Do you envision your TV mounted over an outdoor fireplace? The next factor to look at after determining how you want to live in your space is the layout of the back of your home. You do not want a new roof line to obstruct the view from any second story windows. And, there may be other architectural features you don’t want to or can’t cover up. This may quickly limit your options. If the second story of your home has an abundant number of windows, you may need to choose a lower roof style such as a shed roof or (almost) flat roof. Another important consideration is the orientation of your backyard. Will the space get a large amount of direct sunlight? Based on the direction of your home or the landscaping near your home, does the space need to compete for sun? This will also help to narrow down your choices. Is a shed roof right for you? A shed roof style angles down from the house connection.The shed (or slope) roof is a popular option. A number of techniques can be employed to ensure your room still has an open and airy feel. How about a flat roof? Another roof style option is a flat roof, although this label is a bit deceiving. In order to ensure proper drainage, the roof may look flat but it is appropriately sloped to ensure proper runoff. A flat roof is a more common option for open porches as you’ll see in the image below. It has a wonderful classic look. The addition of a ceiling fan or two on the roof’s ceiling keep the open air porch circulating air quite wonderfully. Can you have a combination of different roof styles? Here comes the fun part. You don’t need to be limited to just one roof style. One of our very popular combination shapes is a shed roof with a partial gable to one or more ends. Take a look at the picture below. What a great way to add custom flair and visual interest to both the inside and outside of your porch. 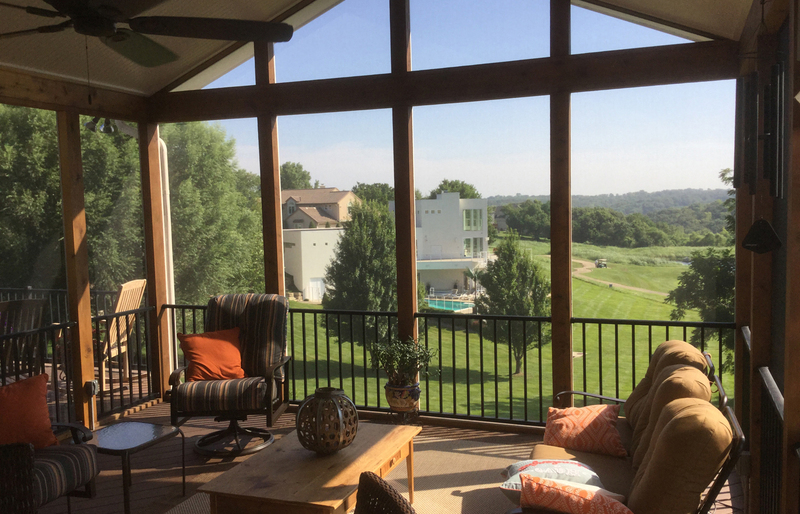 If you’re considering adding a screened porch or open porch to your Kansas City area home, give us a call for a free consultation. We enjoy walking through options and considerations with you to ensure your new room fits exactly how you want to live. Give us a call at (913) 851-3325 and (816) 228-3325.